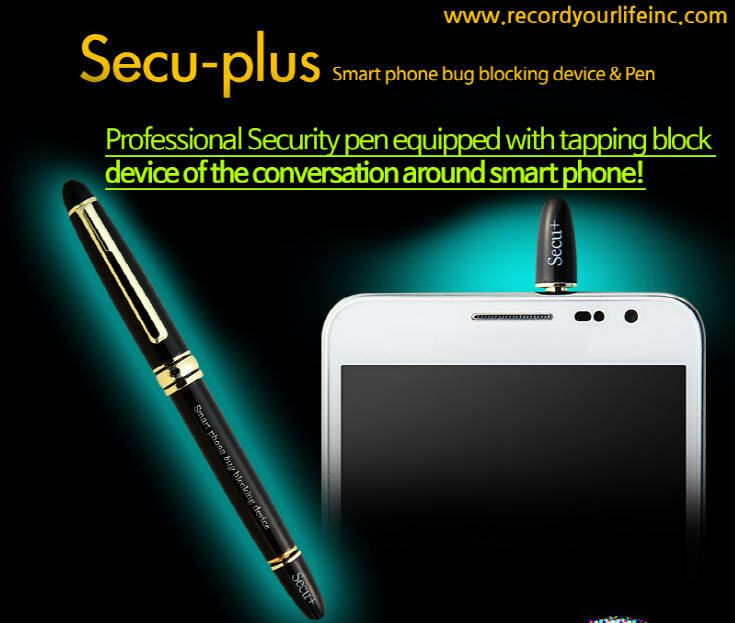 Professional Smartphone bug blocking device / Secu-plus / Record Your Life Inc.
Professional Security pen equipped with tapping block device of the conversation around smart phone! 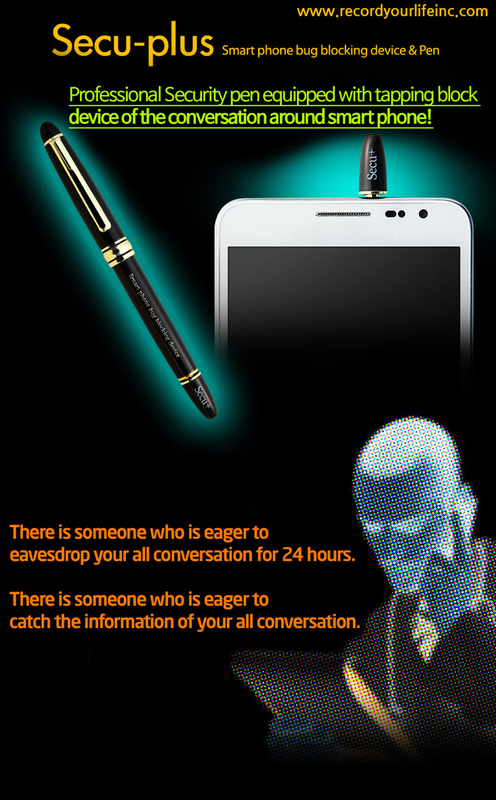 This device protects that the conversation around smart phone is tapped by third party securely anywhere you are!! It is obvious that advent of smart phones in all areas makes people's life more convenient and it is a modern convenience. However, there are many negative side effects of using smart phone such as eavesdropping, hacking, Smishing or Pharming etc and they make us anxious. 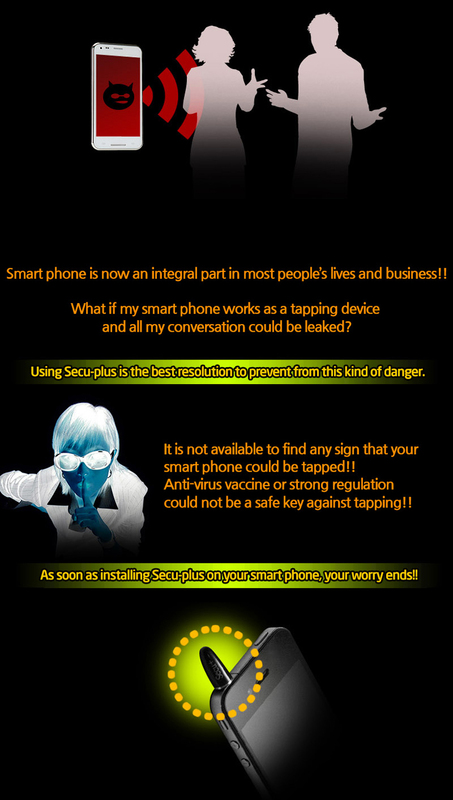 By using Secu-plus, it is possible to protect your conversation against tapping by third party. This device is attached to a ball point pen so, it is easy to carry it. 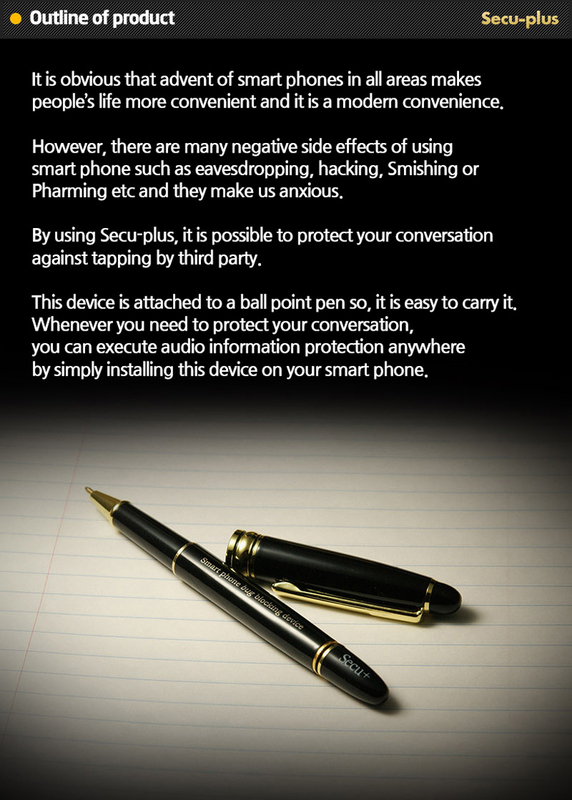 Whenever you need to protect your conversation, you can execute audio information protection anywhere by simply installing this device on your smart phone. Smart phone has a high quality microphone to detect any sound or voice within a few meter radius. If a hacker implants a malicious code of tapping in your smart phone with no need to install any extra tapping device in specific places, infected phone works as tapping device and it leaks the conversation to third party. 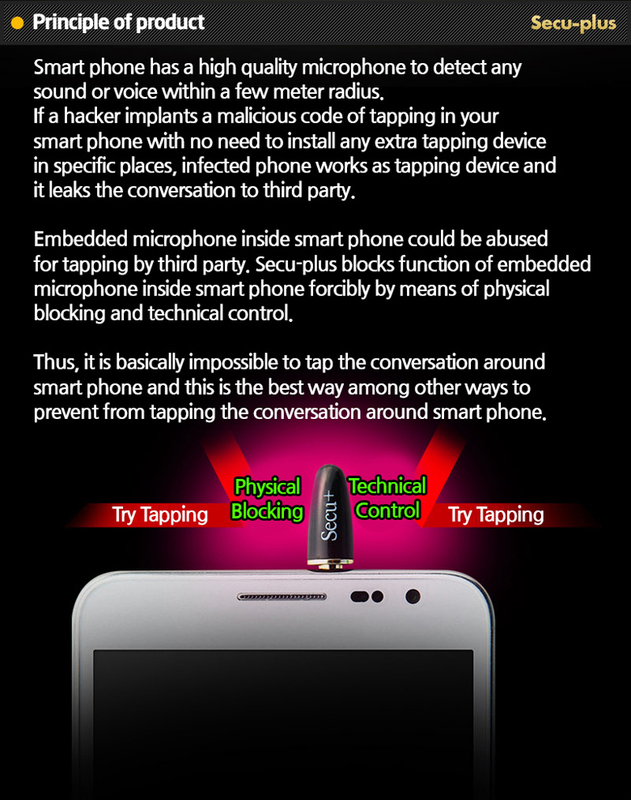 Embedded microphone inside smart phone could be abused for tapping by third party. Secu-plus blocks function of embedded microphone inside smart phone forcibly by means of physical blocking and technical control. Thus, it is basically impossible to tap the conversation around smart phone and this is the best way among other ways to prevent from tapping the conversation around smart phone. 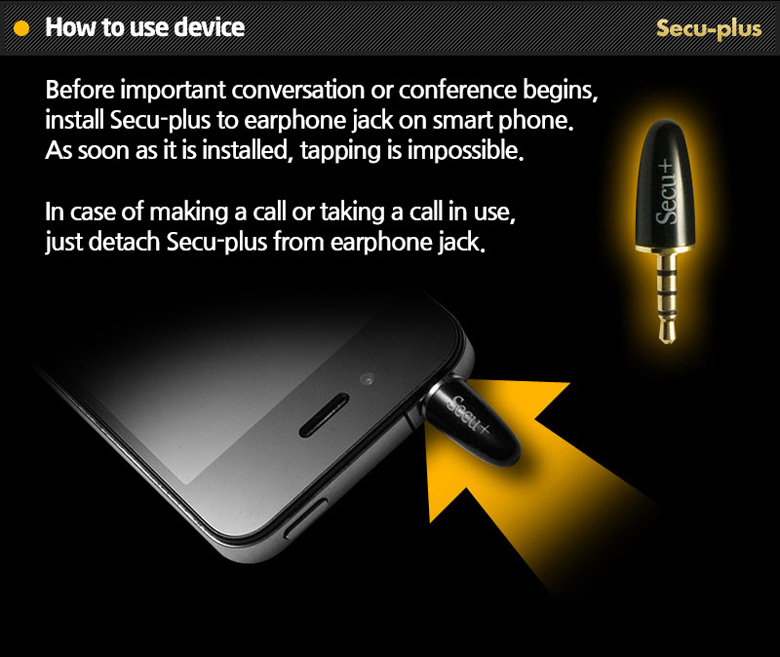 Before important conversation or conference begins, install Secu-plus to earphone jack on smart phone. As soon as it is installed, tapping is impossible. In case of making a call or taking a call in use, just detach Secu-plus from earphone jack. · When to worry about being tapped in daily life. · State agencies where major policies are discussed and determined. · Judicial authorities such as prosecution, police and so forth that have investigation right, where communication security is required for work performance. · Election camps which perform election campaign against competitors, such as Presidential election, general election, municipal election, union election and so on. · CEO, key executives, development department, sales and planning department of companies with possibility of damage by industrial espionage. 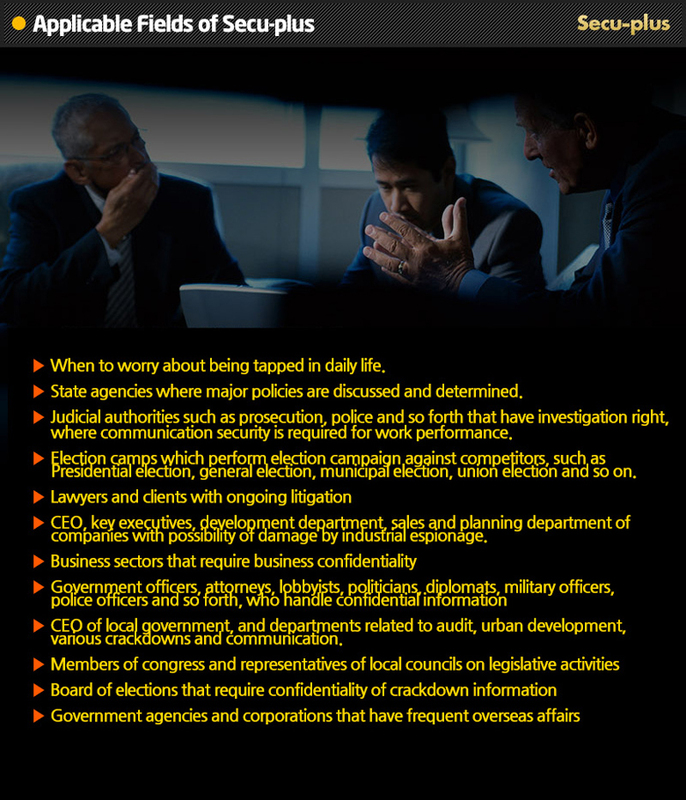 · CEO of local government, and departments related to audit, urban development, various crackdowns and communication.